A summer of events aim to raise career aspirations and widen access to Higher Education. City has hosted a series of events for local school pupils to help them to plan their future. Widening Participation and Outreach have organised taster workshops showcasing different careers and industries, careers fairs with local companies and advice sessions. 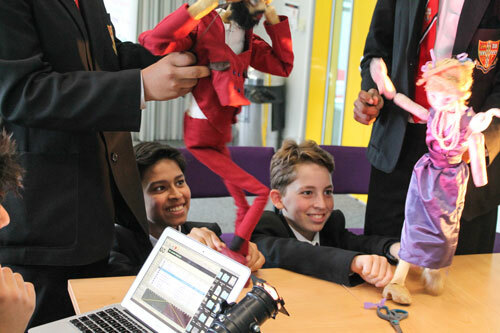 During the events, pupils have conducted forensic investigations, held puppet shows, trialled virtual reality technology and in an upcoming week of sessions will be learning about health and nursing. The events are part of a wider programme that aim to widen access to higher education. The programme gives students from low income backgrounds support and advice about their future. In partnership with St Luke’s Community Centre, City has hosted careers events for local primary and secondary school pupils. On Friday 17th June, around 50 secondary school students attended a pilot careers event called Steps to Success. Pupils from Mount Carmel Secondary School for Girls and Central Foundation Boys School took part in career sessions with local businesses. The primary school event is set to take place on Thursday 30th June. Four schools and more than 150 pupils will take part in workshops with local businesses from engineering firms to hospitality. St Luke’s Primary School, Moreland Primary School, Prior Weston Primary School and Hugh Myddelton Primary School will be attending the sessions. The events aimed to raise student aspirations and to give them information about the different careers available to them. Both events were made possible by the help of volunteers from the local businesses who ran the sessions. The businesses involved include Hogan Lovells (lawyers), Kuoni (travel), Laing O’Rourke (construction), Little Angel Theatre company, Allianz Global Investors (insurance), Kreston Reeves (accountants) and Montcalm Hotels. Feedback so far from the events has been positive, with pupils saying it has helped them to understand the different career options and how they can work towards these in the future. Students from 22 schools across London are set to take part in a series of Taster Weeks at City focusing on subjects from Health Professions and Law and Criminology to Nursing. Taster weeks give students the opportunity to experience university life for an entire week, taking part in a range of engaging activities. The Taster Weeks balance academic lectures, seminars and workshops with social activities as well as providing attendees with the chance to meet and work with current staff and students. The Taster Weeks included sessions like a mock up forensic investigation, visits to the Royal College of Nursing and tours of the University.